Modern guest house on a sprawling 20-acre ranch in Flower Mound, Texas. Flower Mound, Texas + 2,800 sq. 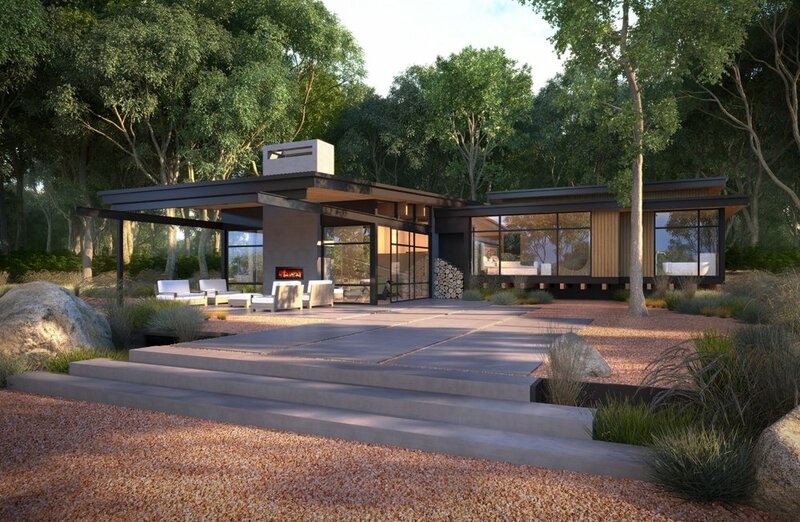 ft.
On a sprawling 20-acre site, dotted with mature trees and native grasses, a young family wants a guesthouse to serve as a residence while a master plan and main home is developed. A: The client is a down-to-earth, outdoor-loving couple with children. They have a long-term plan for their expansive property and, as a point of departure, they want to reimagine and expand an existing structure as a guesthouse and temporary residence. They are future focused and want the new space to be compact and accessible, able to evolve as the project develops and accessible for aging parents. It will serve as a short-term “ground control” and respite for their busy life, recharging and reconnecting them to the environment and each other. Q: How did you solve the Client’s needs for this unique site? A: This particular site slopes has a significant slope toward the tree line and the Client wanted to use the existing foundation. Because this is the guesthouse, we wanted to focus on scale and adaptability. The design had to be intimate and restrained while making sure it made sense with the future construction of the main home. Q: What role did natural elements play on this project? A: We used plenty of steel, wood and glass. The entire rear of the home features floor-to-ceiling windows that give the impression of an open environment – not closed off but allowing the natural elements of the environs to play an integral part of the interior experience. Q: What’s your favorite design element on this project? A: We are really excited about the floating bedroom with supporting wood beams. We love this design detail because it allows the structure to feel engaged with the outside. In addition, there is a corner condition with receding glass that connects to an extended beam intended to visually draw your line of sight out into the woods. These details help lower the design’s profile and stay more consistent with a ranch environment.